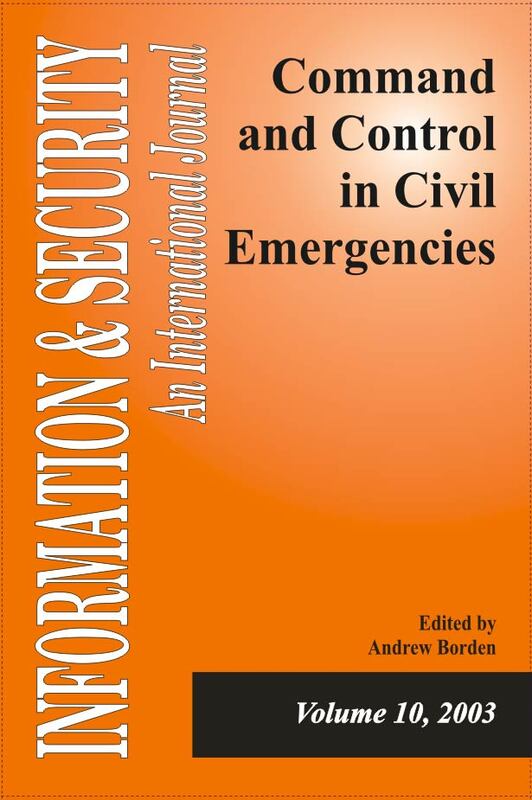 This volume examines the development and application of command and control systems in civil emergencies and disaster management. Particular emphasis is given to crisis management initiatives in the United States and Southeastern Europe, the development of new software tools to aid such initiatives, and the need for closer cooperation in security matters. Other papers examine ways and achievements in the application of commercial-off-the-shelf (COTS) technologies and providing interoperability. "Command and Control in Civil Emergencies." Information & Security: An International Journal 10 (2003): 5-11. Monitor, ISIJ. "Government against the Terrorist Threat of Twenty First Century." Information & Security: An International Journal 10 (2003): 113-115. Monitor, ISIJ. "Police Action against the Threat of Special Weapons of Mass Destruction Chemical and Biological Weapons Terrorism: Forging a Response." Information & Security: An International Journal 10 (2003): 116-117. Monitor, ISIJ. "Chemical and Biological Weapons Terrorism: Forging a Response." Information & Security: An International Journal 10 (2003): 118-125. Monitor, ISIJ. "Selected Internet Sources on Civil Emergency and Law Enforcmenet Issues." Information & Security: An International Journal 10 (2003): 126-134.